I can vouch for their Europeanyness: we have them here in the UK. I have both the basil and the coriander (cilantro) in my freezer, and they are very useful. I’m in the uk too, and bought a fresh stock only yesterday! I read somewhere else that once you’ve finished with the bought contents, you can use them to freeze grated orange/lemon zest in – each cube holds about a teaspoon, which is ideal. Haven’t tried it yet…. And won’t be trying it with an empty garlic container!! Oh, I love these too, as much for their looks as for their brilliant convenience. Oh, yes! I love these, too! The garlic is my fav. They are not just sold at Trader Joe’s. I buy them here in New England at Stop and Shop. So, it would be possible to refill these on a slower-paced weekend, yes? That might be worth looking into for me (since it would alleviate some eco-guilt on my part). I love these, too, but I have to admit that one of the reasons is that, once empty, the little dimpled recesses in the package make it a fabulous small take-along palette for watercolors–you can even snap the lid back on to keep the paints wet longer. I like the convenience too but I have to admit that what attracts me is the packaging. Those little recesses would make great molds. Little sugar cubes decorated with rosettes? I love these! I discovered them a while back at Trader Joe’s and the basil is my favorite – especially since finding fresh basil in the middle of winter on the east cost is difficult. And I’ll admit, I do love popping them out of the little container. So satisfying. And I’m also loving the suggestions on how to reuse the container – I’ll definitely be washing it out for reuse next time. I love them too. especially in the winter when basil is too expensive to buy fresh (and i was also initially attracted to the the packaging). I make a lot of spinach pesto to get some veggies into my kiddo. a few squares of basil love makes it perfect. 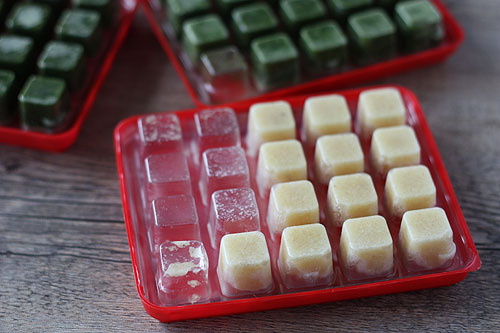 If you’re looking for a herb they don’t carry you can also make your own using ice cube trays. Works for stock and wine too! Love the idea of reusing the packaging for paints. Do they have additives? I have seen the minced herbs in a squeeze tube (and bought some and had near instant buyers remorse), but it had xanthan gum and a ton of sodium which wasn’t ideal for the project I had in mind. I love these-always have them in the freezer. There are a few other varieties that TJ’s does not carry, too, and you can find them at Israeli or Middle Eastern markets some times. I live in Woodland Hills, CA, and Super Sal in Encino has them, I think. The varieties I have seen are Garlic, Basil, Parsley, Cilantro (all at TJ’s), and those + Dill & Ginger at Super Sal. I love these, too. I always try to have garlic and ginger on hand. Their fresh versions always seem to go bad before I can use them up, so these are perfect. Thank you! I haven’t heard of these before, but will look for them next time I’m at Trader Joe’s. My garlic and ginger always seem to go bad, and I cook for one so often have leftover fresh herbs that go to waste. Saw these in the grocery store just the other day! Didn’t buy them then, but they’re going in the cart this weekend. Seanna Lea – Very good question, that squeeze garlic is not so good. Ingredients list on the package for the Dorot garlic: Garlic (91%), Soybean Oil, Water, Salt, Concentrated Lemon Juice. I’m very excited about these!!! Love these, especially when I forget to buy an herb (which I do often) or unexpectantly run out. The basil isn’t quite as good as the leaf but it’s better than nothing. I like the idea of using the separated squares for watercolors. It’s silly to buy minced garlic – its absurdly expensive, especially considering how easy it is to make at home. Food processor + a little bit olive oil. Peel a whole head (or more! ), whizz them around and then jar. You can even dollop them out in teaspoons on waxpaper and then freeze them. Once they’re frozen pop them in a freezer bag and then you have pre-portioned frozen herbs. A head of garlic is max, 50 cents it wouldn’t take your more than 5 minutes to make little freezer dollops, less to just stick it in the fridge. Then your foodprocessor goes into the dishwasher, so almost no cleaning. Laura – I appreciate the instructions, but I disagree about it being silly. I know and appreciate that I am paying for the convenience of not having to prep the garlic on my own. We have had similar products in Canada since 2000. The company that makes them is called Toppits. They sure are convenient! These garlic cubes are my dirty little secret. Megan, in Seattle you can get the chili and ginger at Ballard Market or Central Market. Laura & other readers: do you know about raw garlic, olive oil and botulism? Ooh, they look so great! I was thinking I wouldn’t have a chance at finding them, though, since I don’t think you are near me, so I was happy when you said you got them at TJs, and thrilled to know that someone else here in New England has seen them at Stop ‘N’ Shop. They will definitely be going on the grocery list! Nella – Valid point, Laura does mention portioning the minced garlic and freezing it. If done right after creating it I think that would be plenty safe. Shelley – Yay, thank you! I need the ginger, I don’t use it very often and I have a knack of grating my fingers along with my food so that would be perfect. I’m pretty sure they are Israeli brand. They are very handy (especially ginger which I dont use a lot of) but not very economical. You could always buy it once and reuse the containers with DIY. Since the economics of buying these has been brought up a few times I just wanted to pipe up and explain my own views on the cost/benefit of frozen herbs, knowing of course that for other people it will weight out differently. Due to busy schedules and creative projects that keep us from cooking weeknight dinners more often than not I actually find buying frozen herbs far cheaper and environmentally friendly than purchasing fresh herbs. Using a little bit of basil or ginger for a recipe and then following our bi-weekly ritual of tossing dessicated and/or moldy items isn’t adding up . And before you say it, let me point to my very feared black thumb by way of explaining that I have given up on growing my own fresh. Believe me, I’ve tried. If I cannot keep a rosemary bush alive abandon all hope ye who enter here, etc. If I could buy 6 basil leaves, or an inch of ginger, or three garlic cloves at a time I totally would. If I may, these are brilliant. Been using these for years as fallback. Forgot to buy garlic? No problem. Need cilantro or basil in winter? There you go. Could we do the same from scratch? Um, sure…but that’s not the point. No, it’s not ideal, but it is unbelievably helpful in a pinch. For those w/o Trader Joe’s, I am sorry on many levels. The one caveat for this product is that if you don’t use it up quickly, the smell can defuse to elsewhere in your freezer. I’ve had several frozen ice masks that I keep for migraines end up garlic scented because there was a packet of Dorots in the freezer with them. I love Dorot! I use all three pictured ALL the time. Megan – I completely agree with your rationale. I also absolutely hate peeling garlic (yes, I smash it first) and cleaning out my garlic press. I want to get supper on the table fast and eliminating one more step in worth it for me. Nella – Thanks for the info for us readers. I too have heard about the botulism years ago and have avoided refrigerator garlic prepartations for that reason, I’m paranoid that way. I *strongly* recommend that before lauding a product you discuss its origins. This is an import from Israel, and by purchasing and advertising its use you are undermining the Boycott and Divestment Sanctions movement. Even if you do support the obscene amount of US money that is funding Israel’s arms program (and the occupation of Palestine and the growing threat of nuclear war against Iran), you should be improving consumer knowledge, not obscuring. Additionally, freezing small amounts of basil, garlic, and other herbs in ice-cube trays is a very simple, economical, and socially/environmentally responsible alternative. I thought this was humus for some reason when I first saw the package. But I would definitely prefer this to chopping garlic. I shop at WholeFoods a lot so I’ll be looking out for this during my next visit :3. Bless you. I HATE chopping, and I can’t wait till my next TJ’s trip to put these in my cart!! I use way too much garlic for something like this to be practical, but the ginger version (different country, different brand) has increased my ginger intake 1000%. No more grating my fingers to the bone! NotJamesDean-don’t be such an a$$ to assume everyone agrees with the same thing you do. You told her, oh yes you did. Thank you for the review of these products. I’ll keep chopping garlic, but the herbs & ginger sound great! The Dorot cilantro has punched up many a pot of rice in this house! Love these things. I have been buying these for a while at TJ’s, but I just noticed them at Costco the other day too. They had a big variety pack of them. Thanks for posting this! I see these all the time at Trader Joe’s (also attracted to the packaging) but I never pick them up. These would be great for lazy weekday meals. I know exactly what you mean about dishes you have to wash later – every meal I make after work is like a game to figure out how few dishes I can make dirty so this is perfect! GENIUS! Looks like I’m off to Trader Joe’s to stock up. Love these and use them all the time. My grocery also has a store brand of finely chopped spinach that comes in little pellets. So easy to throw into eggs, sauces, or wherever I want to sneak in my veggies for the day. I’ll definitely have to try these. I wanted to share a tip that I recently saw on Rachel Ray’s show. She suggested peeling your ginger and putting in a ziploc bag in the freezer. When you need some just pull it out and grate it while it’s still frozen. It makes it easier to grate and prevents waste by keeping the ginger useful for a long time. I’m not usually a RR fan but I’ve been loving this tip. I have been unable to find these wonderful cubes. At one time Target carried them here in Florida I’d love to buy them again!!! Vanda – I’m afraid I’m unable to advise you, perhaps write to Dorot on Facebook and ask where you might find it? They also have a “find our products” link at the top of their website but for me it defaults to the US – I’m not sure if you would get a different page when you are located in the UK. I love these things, but try to buy them in bulk only when they’re on sale. I’m thinking of making my own with garlic, as it does start to add up (especially since there are very few recipes I make that don’t have garlic in them and it’s cheaper to do my own). I personally find the ginger, cilantro, and parsley very useful too. I have the chili, but haven’t used it yet. Especially with two kids (toddler and infant) it saves time to have these on hand. I used to buy these little frozen garlic cubes in Montreal (I think they were labelled “Top-it”) but I’ve not seen them since moving to Edmonton, Alberta. I’d love to know where to buy them here. They’re wonderful!!!! I found crushed ginger cubes at a Walmart in Virginia. 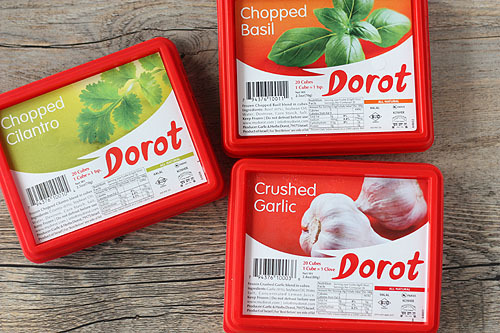 The packaging is very similar to the Dorot brand. I didn’t see any other varieties, but they may be there. Found these at Weis and Walmart but went back to Walmart yesterday and they don’t have them now. I love the ginger. I always lose my fresh ginger and these are just perfect. I live in Los Angeles and have only been able to find the crushed garlic and chopped basil Dorot products. Trader Joe’s told me today that the cilantro is discontinued (I’m never sure if that means the manufacturer no longer makes it or if their distributor no longer carries it). I emailed the company through their website, but the email bounced back as undeliverable. Any thoughts? Love this product. Does anyone know if these are organic and free of GMO’s? Thanks!